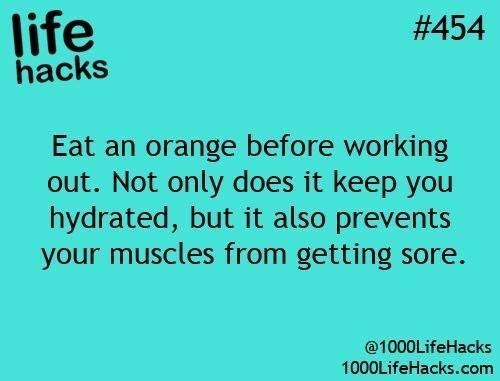 LIFE HACKS $#454 EAT AN ORANGE BEFORE WORKING OUT. NOT ONLY - ProudMummy.com the Web's Community for Mums. LIFE HACKS $#454 EAT AN ORANGE BEFORE WORKING OUT. NOT ONLY DOES IT KEEP YOU HYDRATED, BUT IT ALSO PREVENTS YOUR MUSCLES FROM GETTING SORE.